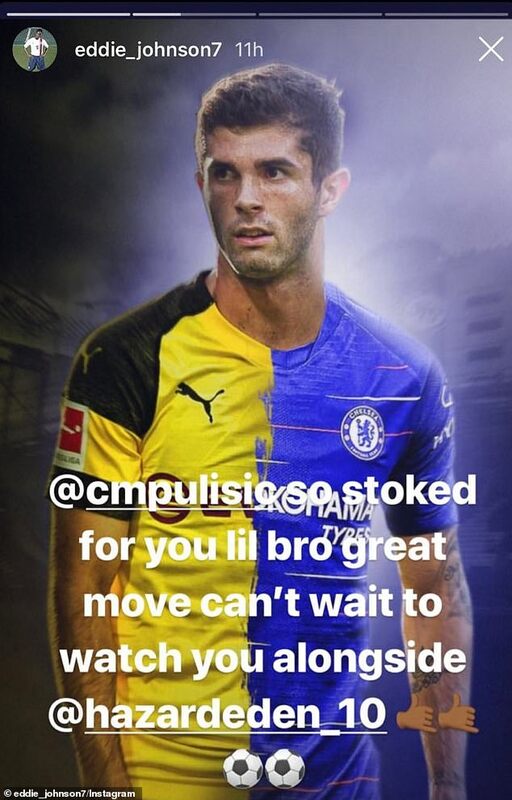 Ex-USA international Eddie Johnson may have accidentally revealed Christian Pulisic’s next club after congratulating him regarding the same via his Instagram account. The 20-year-old has been widely fancied to make way from Borussia Dortmund with his contract expiring in 18 months’ time and it appears that Chelsea may have won the race to acquire his signature. In a report covered by The Mail, there appears a screenshot from Johnson’s Instagram account ( which has since been deleted) where he appears to congratulate the attacker for getting the chance to work alongside Eden Hazard at the Bridge. Both Liverpool and Chelsea have been credited with an interest in Pulisic over the past six months but the latter are understood to have the advantage in the player’s pursuit, given they could offer him a regular starting role unlike the former. The likes of Pedro and Willian have already crossed their 30s where their performance levels are likely to drop and the duo may drop down the pecking order, should Pulisic indeed seal the much-fancied switch to the Blues. Meanwhile, the future of Eden Hazard remains a question in itself beyond the current season and there are contrasting reports suggesting that Pulisic could potentially succeed the Belgian at the Bridge after his initial settling period this term.